The Project implementing is a Gas leakage alarm system that senses the leakage of LPG from Gas cylinder or Gas stove and gives a warning alarm. Its further modification can be automatic cut off the electricity system in the home and also a battery operated exhaust fan to remove the leaked gas from the room. LPG Sensor modules are available now at low cost and we can use it in the Kitchen as a Gas leakage Alarm. 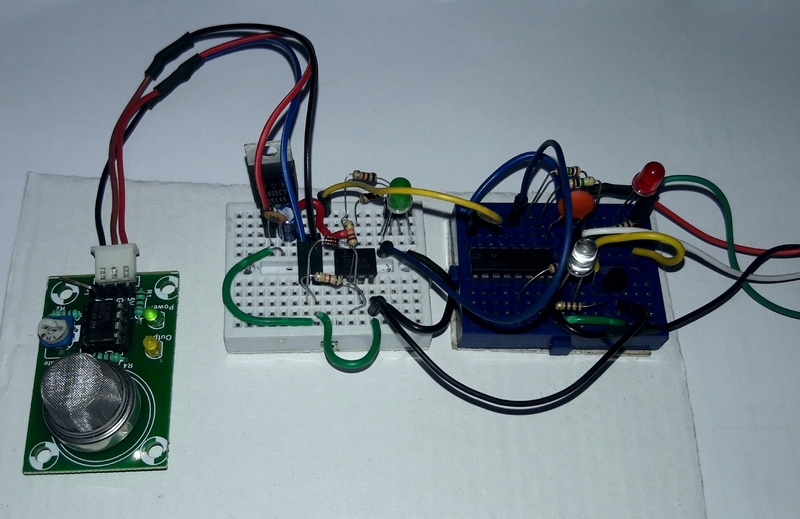 The Module has a MQ6 Gas sensor, an Op-Amp as comparator and a preset for adjusting the sensitivity. All we need is a load resistor at the output to connect with the alarm circuit. Module is very sensitive to LPG (Liquefied Petroleum Gas) which contains Propane and Butane. The MQ6 sensor detects the gas concentration between 200 to 10,000 ppm. The module works off 5 volts DC and has two outputs. 1. The Analogue output ( A) can be used to drive a buzzer through a driver transistor. 2. 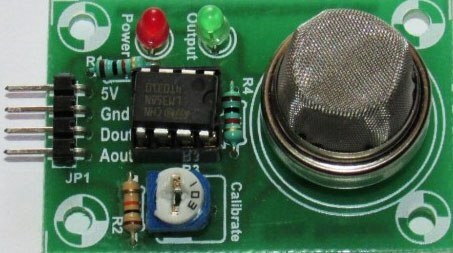 The Digital output ( D) can be used for Micro controller based circuits. The MQ6 LPG Sensor has 6 pins. But in the Sensor module, the MQ6 is already connected. The circuit uses MQ6 LPG sensor module that detects the molecules of LPG in the air. When it detects the LPG molecules , the module gives a high output which is used to trigger the Comparator built around IC2 ( CA3140 ). When the voltage in the Non inverting input ( Pin3 ) of IC2 goes high due to the presence of the high voltage from the MQ6 module, output of IC2 turns high. This high output triggers transistor T1 . When it conducts, its collector is grounded and activates the timer IC CD 4060 (IC3). CD 4060 (IC3) is the Binary counter with 10 outputs that turns high one by one when it oscillates with C1 and R6. The oscillation of the IC3 is indicated by the blinking of Yellow LED (D3). 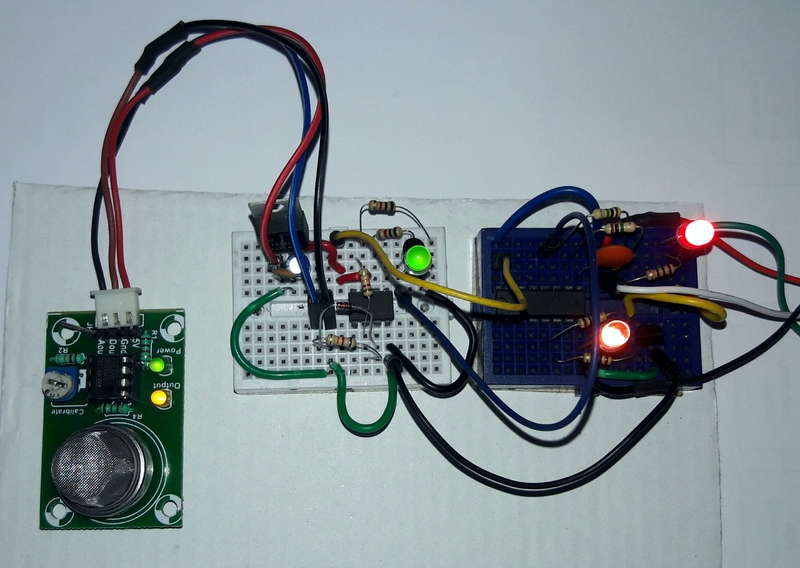 When the output Q6 ( pin 6 ) of IC2 turns high after 15 seconds, T2 conducts and activates the buzzer and Red LED ( D4) . The alarm repeats again after 15 seconds if the LPG molecules remains in the air.